Alex Maddalena had gone five years without seeing a dentist. Alex Maddalena, 79, at an appointment with Dr. Karen Becerra of the Gary and Mary West Senior Dental Center in San Diego. Mr. Maddalena went to the clinic in January for his first check-up in five years. Credit Carlos Moreno for The New York Times. He knew that he needed to. It hurt to chew. A couple of teeth had grown discolored, so he tried not to smile broadly. His daughter kept urging him to get a checkup. The reason he didn’t: money. Medicare has never provided dental care, except for certain medical conditions, and California’s Medicaid program covers only some services, at reimbursement rates so low that most of the state’s dentists do not accept Medicaid patients at all. 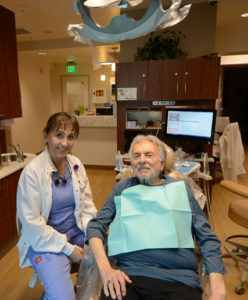 By the time Mr. Maddalena, 79, made an appointment at the new nonprofit Gary and Mary West Senior Dental Center in January, he had advanced periodontal disease, a couple of large cavities and three teeth that needed extraction. “The destruction had advanced to the point that we couldn’t save them,” said Dr. Karen Becerra, the center’s dental director. Many Americans find it difficult to obtain adequate dental care, but the problem is particularly acute among older Americans like Mr. Maddalena. Fewer than half of Medicare beneficiaries have visited a dentist in the past year, a rate that sinks to 26 to 28 percent at lower income levels. At the West Center, where the average patient lives on $850 a month, “they often haven’t seen a dentist in 10 or 20 years,” Dr. Becerra said. “They’d end up in the E.R. when the pain got unbearable.” She has seen patients who have pulled their own teeth. Please read the full article in The New York Times.